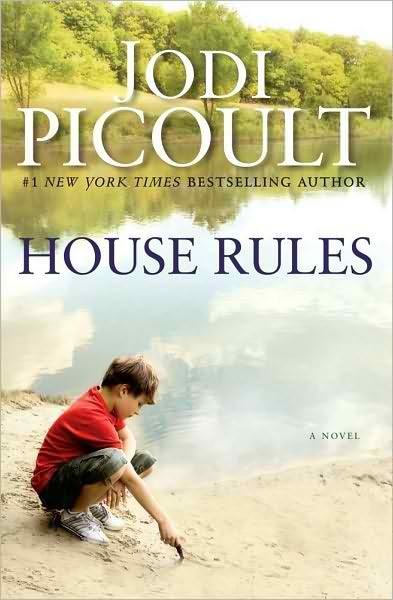 House Rules is Jodi Picoult's seventeenth novel and details the aftermath and effects of a terrible crime on a family when a young man with Asperger's syndrome is accused of murder. House Rules is told from each family member's point of view as they deal with the tragedy and readers are challenged with solving the mystery of who really committed the crime. House Rules is no different from other novels by Jodi Picoult ; we become intimate with the private voices of each character and also with the courthouse setting in which facts and details of the crime are presented. In House Rules , Picoult has researched Asperger's syndrome and how the unique traits of the syndrome can undoubtedly incriminate a person who has it when suspected of murder. What makes the plot of House Rules unique are the cast of characters: Emma is a single mother whom, with the help of her younger lawyer Oliver, begins to accept her life and approach it differently in a new light. Jacob, her accused child with Asperger's is a forensic analysis expert thanks to his hobby and interest in crime scenes while Theo, Jacob's younger brother, is searching for his own place and identity in the shadow of constant scene-stealing Jacob. Between Emma's strong composure, Oliver's happy-go-lucky demeanor, Jacob's frank literalism and Theo's loyalty to his brother and sweet desire to belong, House Rules will provide value to all types of readers and every type of person. The crime and mystery components of House Rules will be easy to solve for seasoned readers, but the ride itself is fun, and that's what truly matters with a good book. House Rules is nearly impossible to put down despite its length, so hold no reservations when diving into this novel. My favorite elements of House Rules are Emma's ability to let go and let loose when Oliver comes into her family's lives and also the demonstration of pure love and devotion between two brothers and just family in general. Fans of Jodi Picoult will definitely enjoy House Rules , and readers new to Jodi Picoult's work should also consider reading Nineteen Minutes (2007), Vanishing Acts (2005), and Salem Falls (2001).